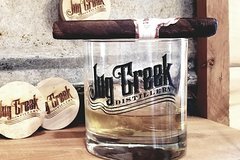 Jug Creek Tour and Tasting includes a tour of the scenic 54 acre property, including the still house. The tour duration is approximately 30 minutes with minimum walking. At the conclusion of the tour each costumer will receive a tasting of 8 - 9 products and a few surprises along the way. At Jug Creek we have food available at Pop's Pickins on Saturday and Sunday so come Hungry! We also have a signature craft cocktail menu to wet you whistle while you tour. Tours are available Wednesday 11 AM to 5 PM, Thursday 11 AM to 5 PM, Friday 11 AM to 5 PM, Saturday 11 AM to 5 PM, and Sunday 11 AM to 5 PM. All tours start at the top of the hour and begin on the front porch. Please Check in at distillery prior to tour. Jug Creek tours are more like a conversation, we begin on the front porch with introduction to the property. Second stop is the tasting room to discuss and discover some of the unique things housed in our tasting room. Third stop is in the still house, where we discuss the art of fermentation and distillation. Last Stop is back in the retail/tasting room to enlighten you with our spirits.